The modern farmhouse at 9 Clocks Lane combines a Scandinavian vibe and a Californian flair. DARIEN — Architect and contractor Paul Harris of Archetype in Westport combined clean straight lines, simple trim, and open sun-filled spaces with a Scandinavian vibe and a Californian flair to create a chic, modern farmhouse at 9 Clocks Lane — not to be confused with Clock Avenue, also in Darien. 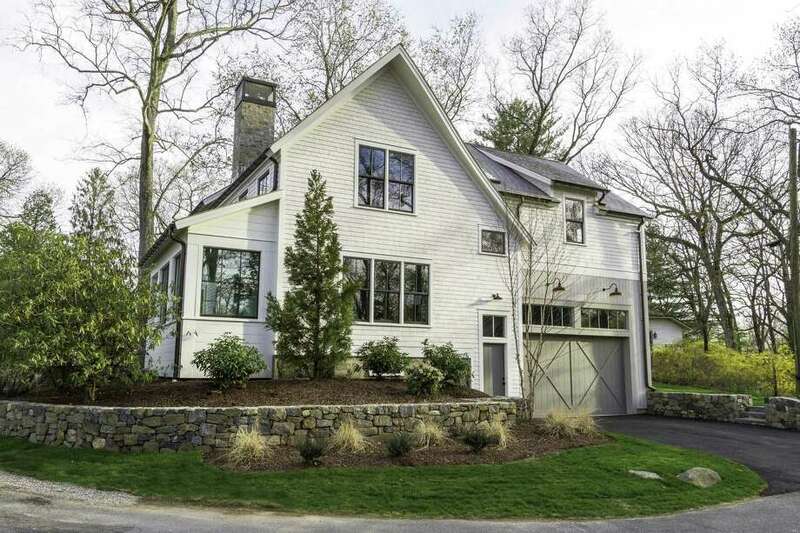 The farmhouse style is underscored with the exterior of cedar shingle and rough barn siding and the barn-style doors of the attached, under-house two-car garage. The garage doors are topped with transoms. Harris gave this newly constructed nine-room house over-sized bronze-aluminum clad windows to bring in lots of natural light, white oak floors with a European finish, custom designed and built cabinetry, and designer lighting and plumbing fixtures. He also gave it unique features like an entrance foyer that serves double duty as a casual sitting area and an office that is located on a landing halfway up the staircase to the second floor. It’s definitely not cookie cutter. This 3,500-square-foot house was built this year in the Cedar Gate Association on a quarter of an acre largely level property. Its backyard has a raised bluestone patio with a natural gas connection so that a barbecue or outdoor kitchen can be installed in the future. At the covered front entrance the door has four large panes of glass and a practical handle rather than a door knob. That way, if the home-owners have an armful of packages or groceries they don’t have to put down anything to open the door; a feature more often seen in European construction than in the United States. From the foyer there are two entryways into the living room, which has a stacked stone fireplace. The dining room has a tray ceiling of shiplap and milled beams and sliding doors to the patio. In the gourmet kitchen the features include a long center island with a breakfast bar, Carrara marble counters, pantry, and an over-sized stainless farm sink. High-end appliances include a 48-inch imported Bertazzoni professional gas range with double ovens, a Frigidaire refrigerator with French doors, and a Bosch dishwasher. The tray ceiling of the dining room continues into the kitchen. Off the kitchen there is a mudroom and hallway with six closets, a half bath, and access to the garage and basement. The office has a wall of built-in shelving, desk with drawers, and a window seat with storage underneath. On the second floor the spacious master suite has a large walk-in closet with organizers, and its bath has a double vanity topped in Asian white marble, a large shower, and a soaking tub. The second floor laundry room has an Electrolux washer and dryer. There are three more bedrooms on this level; one is en suite and the other two share a hall bath. The finished third floor can be used for almost any purpose; a play or recreation or game room, or an exercise area. There is also a large storage area. On the unfinished lower level there is the room to create a wine cellar. Another benefit of this property is its proximity to Post Road (Route 1) shops and restaurants, I-95, and the train station, all just a mile away.